August 12, 2011, part 1 of 1. U.K. Prime minister David Cameron has announced sweeping new powers to be given to police to curb violence and restore law and order in the country. 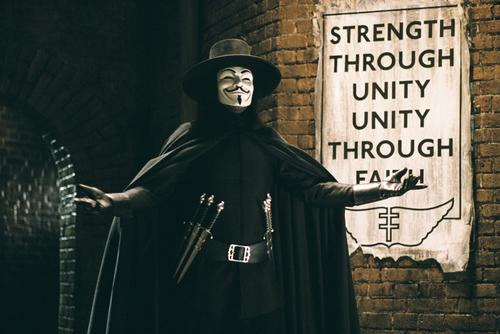 Many of the themes in his speech before Parliament on 11 August are reminiscent of the film "V for Vendetta", which is a satirical depiction of a totalitarian society ruled by a corrupt elite who keep the population in a state of abject fear and dependence through engineered crises and state terror. Tonight we bring you the audio from that speech with commentary. In the second half we are joined by Chris Tolland (2RSR Radio Sydney) to reflect upon and discuss the questions and concerns raised by the impending crackdown in the UK. Just thought I’d poke my head in with some words of support. Hereward and Josh, how blind you still are. You only know what is being feed to your on TV. The people of Libya love Gaddafi I bet you don’t know that. He is not a dictator, you wouldn’t see on our main news how many many thousands all camped around his compound in total support of him. Josh why do you hate him? What story have you been told ? The man liberated Libya from the terror that is facing them again and with the help of NATO. As long as Muslims are killing Christians or Buddhists… no troop intervention is needed. As long as Sunni Muslims are killing Shiite Muslims… no troop intervention is needed. Syria is a Shiite led country that controls the Sunni majority population. Do you think the UN… oops… NATO (Remember they want us believing NATO is in control instead of the UN)… will intervene? The world has to save the Muslims from killing each other! NATO was once considered a washed up organisation without any real direction. It took 9/11 to activate it again. Are you familiar with the 2004 NATO Istanbul Summit in Turkey? Probably not… the stories of Iraq were headlines of the day back then. Do you know what NATO really is? What it stands for? Who are the members? Do you find it a little bit interesting that NATO is now the target for all these Islamic nation affairs instead of the UN? It should… because the UN is made up of a majority of Islamic nations that decides what to do in these Muslim countries. Start directing the masses to believe it’s the NATO countries instead. Keep feeding the world to believe it’s everything else except for Muslims. 1) On July 21st, 2009 Islamic scholars gathered in Istanbul to blend those two shades of green with a seven-year action plan on global warming. You’re being toyed with… the question is… do you have the capability to decipher what really is going on? by Susan Lindauer, former US Asset covering Libya at the United Nations.